Hepatitis Monthly - Platelet Count/Spleen Diameter Ratio and Shear-Wave Elastography for Non-Invasive Prediction of High-Risk Varices: Can We Delay Screening Endoscopy for Compensated Cirrhosis? Platelet Count/Spleen Diameter Ratio and Shear-Wave Elastography for Non-Invasive Prediction of High-Risk Varices: Can We Delay Screening Endoscopy for Compensated Cirrhosis? To Cite: Yegin E G, Karatay E, Celik G, Aldag B, Tuney D, et al. Platelet Count/Spleen Diameter Ratio and Shear-Wave Elastography for Non-Invasive Prediction of High-Risk Varices: Can We Delay Screening Endoscopy for Compensated Cirrhosis?, Hepat Mon. 2017 ; 17(12):e57226. doi: 10.5812/hepatmon.57226. Background: Periodic Upper Gastrointestinal Endoscopy (UGIE) for Oesophageal Varices (OVs) is recommended in all compensated cirrhotic patients. The prevalence of early stage cirrhosis is on the rise with the contribution of non-invasive models for liver fibrosis. The healthcare system needs to focus on cost-effective surveillance strategies re-channelling its efforts for high-risk OVs. This study evaluated whether non-invasive means for prediction of high-risk OVs could limit UGIEs among the the Child-Pugh class A cirrhosis population. Materials and Methods: Endoscopic, clinical, and laboratory data were retrieved from medical records. Shear-Wave Elastography (SWE) and ultrasound spleen measurements, Platelet Count/Spleen Diameter (PC/SD) ratio and Child-Pugh score calculations were performed. Results: Successful elasticity acquisitions were performed in 99 cirrhosis patients. Child-Pugh score was A in 67.2% cases. The PC/SD ratios were significantly associated with high-risk (grade ≥ II) OVs (P = 0.002), whereas elasticity measurements were not. No significant differences were found between Child-Pugh classes for both parameters (P > 0.05). The AUROC values for the prediction of high-risk (≥ grade II) OVs were moderate for PC/SD ratio (0.748), and poor for SWE (0.514). The PC/SD ratio cut-off level with best negative predictive function (93%) was 1298 to serve for excluding high-risk OVs in Child A patients. Conclusions: For compensated cirrhosis patients, the SWE was limited in accuracy to predict high-risk OVs, while PC/SD ratio appeared as a useful tool to exclude high-risk OVs giving UGIE priority to those at greatest risk for bleeding. High-quality evidence is required to delineate and prioritize endoscopy indications for Child A patients in consensus guidelines to minimize the burden from unnecessary screening UGIE procedures. Progressive hepatic fibrosis is a common pathological process of chronic liver injuries, eventually leading to cirrhosis. Esophageal varix related to Portal Hypertension (PHT) is a potentially lethal complication of cirrhosis because of the dangerous variceal hemorrhage risk; despite the improvements in the management, mortality rate still remains as high as 20% within 6 weeks of the bleeding episode (1), justifying screening for OVs. The prevalence of OVs is strongly associated with the severity of liver disease as assessed by Child-Pugh class. The OVs are present in 40% of patients with Child-Pugh class A and 85% in those with class C cirrhosis (2). Annual rate of variceal hemorrhage is 5% to 15% (3), and the highest risk occurs from larger varices (medium/large OV), especially those with red signs, and in patients with decompensated cirrhosis (Child B/C) (4); therefore, primary prophylaxis, which relies on either pharmacologic or endoscopic treatment applies to these conditions. For this purpose, current guidelines recommend endoscopic screening for all cirrhotic patients at diagnosis (5), although patients with Child A cirrhosis have substantially lower rates of medium/large OVs. In addition, a subsequent surveillance is advocated with a periodicity of every 1 to 3 years, depending on the size of varices, the presence of red signs and decompensated cirrhosis (Child B/C) (5). The latest American Association for the Study of Liver Diseases (AASLD) guideline does not recommend primary prophylaxis for patients, who do not have varices; recommends primary prophylaxis for patients in any Child-Pugh classes with medium/large varices, and with small varices as long as they have Child B/C decompensated cirrhosis (5). Considerable interest has been directed to develop non-invasive models to predict Clinically Significant PHT (CSPH), OVs, and variceal hemorrhage risk. Researchers have investigated different prediction models by using laboratory or Ultrasound (US) parameters, such as Platelet (PLT) count, Aspartate Transaminase (AST) to PLT Ratio Index (APRI), Fibrotest, spleen size, portal vein diameter, And Transient Elastography (TE). However, no consensus exists with regards to an optimal measure. Shear-Wave Elastography (SWE) is a relatively new modality, which has some advantages with respect to TE: It has the advantage of displaying a quantitative map of liver elasticity on a color-coded image superimposed on real-time B-mode images (6, 7). The elasticity acquisitions can be performed by the visual control of the operator, avoiding measurements from the interfering structures like kidneys or in nearby vessels. Preliminary results suggest that SWE is at least as good as TE for diagnosis of clinically significant fibrosis, and may have higher applicability in challenging cases of obesity and ascites (8-10), yet there is limited data on the issue of non-invasive prediction of high-risk OVs, based on SWE values. Since SWE could be implemented into a regular US imaging device, it would bring no additional burden when simultaneously assessed during the recommended Hepatocellular Carcinoma (HCC) US surveillance. One other non-invasive means is the Platelet Count (PC)/Spleen Diameter (SD) ratio (PC/SD) based on a regular laboratory result and an imaging parameter, which are already available for cirrhotic patients. Since an initial report in 2003 by Giannini et al. (11), a number of studies have investigated the accuracy of PC/SD linking to the presence of OVs in cirrhotic patients (12-15). Preventive measures are only applied in the presence of medium-large OVs for Child A cirrhotic population because of the lack of established primary prophylaxis, endoscopic screening in Child A subjects with no or small varices are of unclear benefit. Previously, early stage cirrhosis was underdiagnosed, possibly due to low rates of biopsy in this silent state. Currently, the prevalence of histological cirrhosis may be significantly on the rise due to purposeful screening for prognosis and treatment decisions with the contribution of non-invasive models for liver fibrosis. Moreover, the decrease in fibrosis progression rate or even fibrosis regression in the era of successful hepatitis B and C therapeutics is expected to be translated to important clinical outcomes, such as improvement in Child Pugh’s score, decrease in portal pressure, and increased survival. Thus, at this point, endoscopic surveillance may be less necessary and may not be justified for all Child A patients. Concerning the increasing patient burden, related morbidity and costs, the healthcare system needs to focus on more cost-effective surveillance strategies re-channelling its efforts for high-risk OVs. Search of the literature indicates limited studies on non-invasive prediction of high-risk OVs specifically in Child A cirrhotic population. The present study specifically attempts to evaluate the accuracy of SWE for non-invasive prediction of high-risk OVs and compares it with a non-invasive simple score PC/SD ratio to clarify whether screening UGIE could be performed selectively only on high-risk patients in the compensated Child-Pugh class A cirrhosis population. The study cohort included adult patients retrospectively identified from the Hepatology Clinic of Marmara University Hospital medical records by an extensive review between June and August 2014. The inclusion criteria included, (a) cirrhosis diagnosis made histologically or based on imaging with compatible clinical features; (b) having undergone screening endoscopy in the last 6 months; (c) having medical records including complete information for the Child-Pugh score calculation. Patients with hepatic tumor involvement were excluded due to the potential confounding effect. The study protocol was approved by the institutional ethics review board of the Marmara University Clinical Research. Esophageal Varices were classified by a semi-quantitative morphological assessment as follows, Grade I (small) varices were defined as minimally elevated straight veins flattening with the endoscopic insufflation, grade II (medium) varices were defined as non-confluent tortuous veins occupying less than one-third of the esophagus lumen, and grade III (large) varices were defined as confluent coil-shaped veins occupying more than one-third of the lumen (4, 16). Presence of no or small (grade 1) varices were categorized as low-risk, while medium (grade II) or large (grade III) varices were categorized as high-risk. Successful elasticity acquisitions were performed within a median study period of 2.0 months, following the review visit using real-time iU22 Liver Shear Wave ElastPQ (Philips Ultrasound, Bothell, WA, USA) with a convex broadband probe (1 to 5 MHz) by the same trained operator. The examination of the patient was performed in left lateral decubitus position with the right arm elevated, and restricting breathing or any movement. A mean value of seven consecutive measurements (one from the left and the other 6 from the right lobe) from each patient, all sampled from the liver areas at least 6 cm thick and free of large vessels and ligaments, were obtained. The results were expressed in kilopascals (kPa). All patients underwent liver US examination at the time of elasticity acquisitions to assess the SD. The PC/SD ratio was calculated by dividing the number of PLTs/mm3 by the maximum spleen bipolar diameter in millimeters. Cirrhotic patients were classified according to the Child-Pugh score, using 5 parameters, including albumin, ascites, bilirubin, prothrombin activity, and encephalopathy; class A: score 5 to 6, class B: score 7 to 9, and class C: score: 10 to 15. Statistical analyses were performed using the SPSS 17.0 software (IBM, Armonk, NY, USA). Categorical variables were presented as numbers and percentages. Continuous variables of PC/SD ratio, Child-Pugh score, and elasticity data were expressed as medians and Interquartile Range (IQR). The comparison of the continuous variables among patient groups was conducted with the Mann–Whitney U-test or Kruskal–Wallis non‐parametric tests, whereas categorical variables were compared using the Chi-square or Fischer’s test. Spearman’s rank correlation coefficient was used to analyze the correlations between Child-Pugh score and elasticity. The Receiver Operating Characteristic (ROC) curve analysis was performed, and the area under the ROC Curve (AUROC) was calculated to evaluate the accuracy of SWE and PC/SD ratio for the prediction of the presence of high-risk (grade II or III) OVs in Child A cirrhotic patients. A two-tailed P < 0.05 was considered statistically significant. The study cohort included a total of 99 patients, after 7 patients with unsuccessful elasticity measurements, mainly due to obesity or incompliance, were excluded. As for all the enrolled subjects, the mean age was 55.5 years (range, 25 to 84 years), and 55 patients (55.6%) were male. The etiologies of cirrhosis mainly included chronic hepatitis B (n = 30), chronic hepatitis C (n = 18), and cryptogenic (n = 22) cirrhosis. Child-Pugh score was A in 67 (67.2%) cases, B in 22 cases (22.2%), and C in 10 (10.1%) cases. In this cohort, 75 patients (75.8%) had OVs on UGIE, 44 patients had either no or small (grade 1) varices (low-risk varices), and 55 patients had either medium (grade II) or large (grade III) varices (high-risk varices). Table 1 summarizes the characteristics of the enrolled patients. When the total study cohort was considered, the univariate analysis showed that cirrhosis patients with OVs were more likely to have lower PC/SD ratio values than those without OVs (P = 0.004). Also, in univariate analysis, median PC/SD ratio values were significantly associated with the presence of high-risk (grade ≥ II) OVs (P = 0.002) and a past history of variceal hemorrhage (P = 0.017). However, the elasticity measurements did not significantly differ between the 2 groups of patients with and without OVs, with low- and high-risk OVs, or with and without a history of variceal hemorrhage (all P > 0.05). There were no significant differences between Child-Pugh class A and B, A and C, or B and C (all P > 0.05) for these 2 parameters; elasticity measurements and PC/SD ratio values (Table 2). Spearman's rank correlation analysis illustrated that there was a weak (rs = -0.205), but statistically significant (P = 0.042) decreasing trend toward PC/SD ratio values with the increasing Child-Pugh scores. Liver elasticity was not correlated with Child‐Pugh scores (P = 0.410) (Table 3). The top and bottom ends of the boxes indicate the values of the first and third quartiles, respectively, and the length of the box represents the interquartile range (25th to 75th percentile). The horizontal line in each box shows the median. Error bars represent minimum and maximum values (range). Circles (o) represent the outliers. Abbreviations: OV, esophageal varices; PC/SD, platelet count/spleen diameter ratio; SWE, shear-wave elastography. This research studied the ROC analysis for the prediction of the presence of high-risk (≥ grade II) OVs by 2 parameters; SWE and PC/SD ratio in the Child A cirrhotic study cohort. The accuracies indicated by the AUROC values were moderate for PC/SD ratio (0.748), yet poor for SWE (0.514); the accuracy of PC/SD ratio was significantly superior to that of SWE after pairwise comparisons of the AUROCs (P = 0.025). The optimal PC/SD ratio cut-off level was determined as 731, and its sensitivity, specificity, Positive Predictive Value (PPV), and Negative Predictive Value (NPV) were 77.1%, 71.9%, 75.8%, and 70.6%, respectively (Table 4). The ROC curves for these parameters are presented in Figure 2. Abbreviations: OV, esophageal varices; PC/SD, platelet count/spleen diameter ratio; ROC, Receiver Operating Characteristic; SWE, shear-wave elastography. The study determined another PC/SD cut-off level to achieve the best Negative Predictive Function (NPV = 93%), which was 1298 to serve as a cut-off to exclude high-risk OVs in Child A cirrhotic patients. This cut-off revealed a sensitivity of 97.1%, specificity of 40.6%, and PPV of 64.2%. It is essential to detect high-risk OVs to initiate timely primary prophylaxis in order to reduce the rate of the life-threatening variceal hemorrhage. An entirely non-invasive means for prediction of high-risk OVs would allow us to limit UGIE screening to a subgroup especially at risk of OV hemorrhage, while minimizing the cost and potential complications by avoiding unnecessary UGIEs in low-risk patients. It could be suggested that a better goal would be the non-invasive prediction of high-risk OVs in Child A cirrhotic population. Patients belonging to Child-Pugh class B/C have higher probability of bearing larger OVs, and also other than the variceal size, their degree of liver failure influences the variceal hemorrhage potential. Also, preventive options of proven benefit, including small varices exist for these patients. A satisfactorily accurate non-invasive model that could replace UGIE seems difficult for OV surveillance in this high-risk Child-Pugh B/C cirrhotic population. In the case of Child A patients, the prevalence of medium/large varices are lower (2), thus the majority of those undergoing UGIE will have small or no varices at all. Detection of no or small varices is of unclear benefit for them, because established prophylactic measures exist only for medium/large OVs in Child-Pugh class A cirrhosis according to the recent guidelines (5). In the recent years, with the availability of non-invasive methods to quantify liver fibrosis, more Chronic Liver Disease (CLD) patients have been identified at the very initial stage when compatible clinical and laboratory evidence (e.g. thrombocytopenia and elevated PT) of cirrhosis do not exist. Furthermore, therapeutic advances in the viral hepatitis have resulted in an improved or stable course in hemodynamic and functional consequences of cirrhosis; the rate of progression of PHT to high-risk OVs could be expected to be slower than before. With this new scenario, an increased proportion of patients are diagnosed in Child A stage, who will be concerned with UGIE surveillance for longer periods than before but with a lower yield. In the situation of increasing UGIE burden and related costs, inconvenience and complications, it could be suggested that endoscopic surveillance cannot be justified for all Child A patients, and non-invasive models are required to restrict UGIE only to those at greatest risk for larger OVs. Recognizing these, the present study was performed to reveal the performances of SWE and PC/SD ratio for the discrimination of high-risk OVs, specifically for the Child A cirrhotic patient population. In the recent years, additional roles for ultrasound-based techniques beyond the initial purpose of a non-invasive detection of significant fibrosis and early stage cirrhosis, have included non-invasive prediction of PHT and its consequences. The TE has been extensively studied in this context, but less data exists for the utility of Real-Time Elastography techniques like SWE, which deserves more attention. The SWE could be incorporated in widely available conventional US device, thus could permit the risk estimation simultaneously at the time of cirrhosis diagnosis or during the HCC surveillance. Thus, an SWE-based high-risk varix prediction model could be advantageous regarding economic benefits, patient acceptance, and medical burden. However, the current study revealed that accuracy with the ROC model of elasticity for the prediction of high-risk OV (≥ grade II) for Child-Pugh class A cirrhotic patients was poor, and significantly inferior than that of the simple PC/SD ratio (0.514 vs 0.748, P = 0.025). Also, elasticity values were not only non-indicative of variceal size, but also were not correlated with the Child-Pugh scores, which reflect the liver synthetic function as well as hemodynamic consequences of cirrhosis. Regarding the PC/SD ratio, this research found a weak but significant negative correlation (rs = -0.205, P = 0.042) between the PC/SD ratio and Child-Pugh score. Consistent with the SWE results, in a recent prospective study including 79 Child-Pugh A - C patients, both SWE and TE techniques demonstrated poor diagnostic accuracies (AUROC 0.600, and 0.630, respectively) for high-risk OV presence (8), despite the high diagnostic accuracies by SWE or TE for detection of CSPH diagnosed by means of Hepatic Venous Pressure Gradient (HPVG) (AUROC 0.870 and 0.780, respectively) (8). Likewise, several studies have demonstrated a good correlation between liver stiffness (1) values and HVPG (17-20), yet there are contradictory results with regards to the size of OVs. Some studies reported a correlation between LS values and size of the OVs (21), while others could not show such correlation (8, 20). A recent meta-analysis (22) stated that LS by TE was limited in specificity and PPV with wide range of performance and cut-off values, precluding its use to replace UGIE for large OV detection. Even though good correlations have been reported between LS and CSPH, LS measurements may not be good enough at predicting high-risk OVs. Two studies (20, 23) stated important findings on the relationship between LS and CSPH, to explain this contradiction. Strong correlation coefficient existed between LS by TE and HVPG values < 12 mmHg, while correlation coefficient dropped to a suboptimal level for HPVG values of ≥ 12 mmHg, which is the threshold for variceal formation and hemorrhage (20, 23). They explained this by the fact that mechanisms of PHT become less dependent on the intra-hepatic vascular resistance caused by accumulation of fibrous tissue (as reflected by an increase in LS) above a degree of HPVG, while complex hemodynamic changes (e.g. hyper-dynamic circulation and splanchnic vasodilatation) contribute to the increase in portal pressure that are not assessed by the means of LS (20, 23). Accordingly, at higher HPVG levels (where larger OV and hemorrhage risk increases), LS may not be an ideal non-invasive surrogate of HVPG, and, thus, its direct consequence OVs. Different predictors, including routine laboratory parameters, such as PC or prothrombin index (24), serum fibrosis markers like FibroTest (25), and US parameters like splenomegaly (26), and portal vein diameter (27), have been proposed revealing certain abilities to predict the presence of OVs; prediction models combining 2 or more of them were also tried to allow a more accurate prediction (11, 28-30). The PC/SD ratio was introduced to allow a higher accuracy than that of the single parameter by the combined model of 2 PHT dependent parameters. Several factors that are not dependent on PHT may contribute to the reduction in PC besides splenic sequestration and include lower thrombopoietin levels, immune-mediated PLT destruction (31), acute bleeding, malnutrition (vitamin B12 deficiency), myelotoxic effects of alcohol, hepatitis viruses, or medications. The PC/SD ratio model normalizes PC to the splenic size by taking into account the splenic sequestrated PLTs attributed to PHT. The increase in spleen size is mainly caused by PHT actively congesting the splenic blood flow, though the interrelation may be complex, while pulp hyperplasia and fibrosis also have some contribution. Using PC/SD ratio strategy is ideal as it is simple, widely available, and clearly preferable to patients, and it would necessarily lower the costs since no additional expenses would be entailed by the use of these 2 routinely performed parameters. Especially, it would help prioritize and refer patients for endoscopy exam where healthcare resources are limited and endoscopy facilities are not widely available. In the proposal report by Giannini et al., PC/SD ratio yielded high diagnostic accuracy (AUROC 0.981) with the cut-off 909 for the presence of OVs in Child-Pugh A-C cirrhotic patients (11). The PC/SD ratio 909 cut-off has been prospectively validated in independent cohorts reporting NPVs of 73% to 100% and PPVs of 74% to 93.8% (12, 15, 32). Also, different cut-offs ranging from 666 to 1014 were proposed with a variety of accuracy values (0.78 to 0.942) for the PC/SD ratio model (13, 14, 33-35). In a multicenter, prospective, validation study by Giannini et al., the AUROC for the PC/SD was 0.860; though lower than that of the initial study, it was still acceptable (15). Additionally, high accuracy was proven to be generalizable across all Child-Pugh classes (15). One study reported a high diagnostic accuracy by combining LS (by TE), PC, and SD for the prediction of high-risk OVs (AUROC = 0.953), while the AUROC values for LS, SD, and PC individually were 0.886, 0.885, and 0.809, respectively (36). Whether addition of LS to form a TE-PC-SD-based prediction model has better diagnostic performance than the PC/SD ratio is not known, because a direct comparison is not available. aData are presented as mean ± SD or No (%). b Two Wilson disease, one chronic hepatitis B virus and hepatitis C virus co-infection, one primary biliary cirrhosis, one primary sclerosing cholangitis, one hemochromatosis. This research studied PC/SD ratio specifically for prediction ability of high-risk OVs in the Child-Pugh Class A cirrhotic population to assist the selection of UGIE candidates. Most of previous studies either did not exclude decompensated cirrhosis (Child-Pugh B/C) or tried to predict the presence of OVs rather than high-risk ones. In the current study, the diagnostic accuracy of the PC/SD model determined by the AUROC was 0.748, and the optimum cut-off of 731 had 77.1% sensitivity, 71.9% specificity, 75.8% PPV, and 70.6% NPV, to differentiate Child A patients with high-risk OVs. This research determined a higher threshold of 1298 to serve as the best negative predictive cut-off (93%), which was better at excluding the patients with high-risk OVs when above the threshold. In the validation study by Giannini et al., when the analysis was confined to Child A subgroup, the initially proposed 909 cut-off was found to have a NPV of 86.9% for the presence of OVs (15). From a safety point of view, it is suggested that a higher cut-off could be more confidently applied with a lower risk of missing high-risk OVs by this non-invasive means, and spare UGIE to those patients below this cut-off, who potentially may have larger OVs. The current study had some limitations, which need to be considered. The existing time between UGIE and SWE examination could have affected the accuracy of SWE on OV prediction. Since OV size classification is mainly a morphological one, assessment over the video records of UGIE examinations by one researcher could have provided more reliable results. These limitations are due to the retrospective part of the study design. Although the researchers provided homogeneity with studying the compensated cirrhosis subgroup, different cirrhosis etiologies may still be potential sources of heterogeneity. Among previous studies, the variability of PC/SD ratio accuracy and cut-off results might relate to different etiologies and severity of cirrhosis as well as the subjective OV size assessment and preclude generalizability of the results. In this sense, some issues need to be resolved before widely applying a prediction model like PC/SD ratio to delay the timing of first screening endoscopy; high-risk OV formation and relevant outcomes should be assessed dynamically by PC/SD ratio monitoring and standard UGIE surveillance in a large-scaled longitudinal study. Errors in spleen bipolar measurement during serial US examinations is another issue to consider when evaluating the changes of PC/SD ratio, yet generally acceptable intra-observer and inter-observer variability has been noted for US spleen measurements (37, 38). Also, the degree of enlargement may vary depending on the etiology of cirrhosis, and spleen tended to be less enlarged in alcoholic cirrhosis compared to other forms (39). Thus, the accuracy of this screening model needs to be clarified across various etiologies of cirrhosis. This present study indicated that SWE was limited in accuracy to predict high-risk OVs precluding its use in clinical practice in the compensated cirrhosis population. The PC/SD ratio’s major role appeared to be the exclusion of high-risk OVs giving the priority for endoscopy exam to those Child A patients at greatest risk for larger OVs, and might be worth translating into clinical practice on the basis of data from future prospective studies. Accumulation of high-quality evidence for non-invasive approaches to delineate and prioritize endoscopy indications for Child-Pugh class A cirrhosis patients in consensus guidelines are expected to minimize the medical and social burden from unnecessary screening UGIE procedures that will likely increase in the future due to the diagnostic and therapeutic advances in CLD. 1. Carbonell N, Pauwels A, Serfaty L, Fourdan O, Levy VG, Poupon R. Improved survival after variceal bleeding in patients with cirrhosis over the past two decades. Hepatology. 2004;40(3):652-9. doi: 10.1002/hep.20339. [PubMed: 15349904]. 2. Pagliaro LDAG, Pasta L, Politi F, Vizzini G, Traina M. Portal hypertension in cirrhosis: Natural history. Oxford, UK: Blackwell Scientific; 1994. p. 72-92. 3. Merli M, Nicolini G, Angeloni S, Rinaldi V, De Santis A, Merkel C, et al. Incidence and natural history of small esophageal varices in cirrhotic patients. J hepatol. 2003;38(3):266-72. 4. North Italian Endoscopic Club for the S, Treatment of Esophageal V. Prediction of the first variceal hemorrhage in patients with cirrhosis of the liver and esophageal varices. A prospective multicenter study. N Engl J Med. 1988;319(15):983-9. doi: 10.1056/NEJM198810133191505. [PubMed: 3262200]. 5. Garcia-Tsao G, Sanyal AJ, Grace ND, Carey W, Practice Guidelines Committee of the American Association for the Study of Liver D, Practice Parameters Committee of the American College of G. Prevention and management of gastroesophageal varices and variceal hemorrhage in cirrhosis. Hepatology. 2007;46(3):922-38. doi: 10.1002/hep.21907. [PubMed: 17879356]. 6. Bercoff J, Tanter M, Fink M. Supersonic shear imaging: a new technique for soft tissue elasticity mapping. IEEE Transact Ultrason, Ferroelect, Freq Cont. 2004;51(4):396-409. 7. Nightingale K, McAleavey S, Trahey G. Shear-wave generation using acoustic radiation force: in vivo and ex vivo results. Ultrasound Med Biol. 2003;29(12):1715-23. 8. Elkrief L, Rautou PE, Ronot M, Lambert S, Dioguardi Burgio M, Francoz C, et al. Prospective comparison of spleen and liver stiffness by using shear-wave and transient elastography for detection of portal hypertension in cirrhosis. Radiology. 2015;275(2):589-98. doi: 10.1148/radiol.14141210. [PubMed: 25469784]. 9. Leung VY, Shen J, Wong VW, Abrigo J, Wong GL, Chim AM, et al. Quantitative elastography of liver fibrosis and spleen stiffness in chronic hepatitis B carriers: comparison of shear-wave elastography and transient elastography with liver biopsy correlation. Radiology. 2013;269(3):910-8. doi: 10.1148/radiol.13130128. [PubMed: 23912619]. 10. Palmeri ML, Wang MH, Rouze NC, Abdelmalek MF, Guy CD, Moser B, et al. Noninvasive evaluation of hepatic fibrosis using acoustic radiation force-based shear stiffness in patients with nonalcoholic fatty liver disease. J Hepatol. 2011;55(3):666-72. doi: 10.1016/j.jhep.2010.12.019. [PubMed: 21256907]. 11. Giannini E, Botta F, Borro P, Risso D, Romagnoli P, Fasoli A, et al. Platelet count/spleen diameter ratio: proposal and validation of a non-invasive parameter to predict the presence of oesophageal varices in patients with liver cirrhosis. Gut. 2003;52(8):1200-5. [PubMed: 12865282]. 12. Agha A, Anwar E, Bashir K, Savarino V, Giannini EG. External validation of the platelet count/spleen diameter ratio for the diagnosis of esophageal varices in hepatitis C virus-related cirrhosis. Dig Dis Sci. 2009;54(3):654-60. doi: 10.1007/s10620-008-0367-y. [PubMed: 18594972]. 13. Baig WW, Nagaraja MV, Varma M, Prabhu R. Platelet count to spleen diameter ratio for the diagnosis of esophageal varices: Is it feasible?. Can J Gastroenterol. 2008;22(10):825-8. [PubMed: 18925306]. 14. Barrera F, Riquelme A, Soza A, Contreras A, Barrios G, Padilla O, et al. Platelet count/spleen diameter ratio for non-invasive prediction of high risk esophageal varices in cirrhotic patients. Ann Hepatol. 2009;8(4):325-30. [PubMed: 20009131]. 15. Giannini EG, Zaman A, Kreil A, Floreani A, Dulbecco P, Testa E, et al. Platelet count/spleen diameter ratio for the noninvasive diagnosis of esophageal varices: results of a multicenter, prospective, validation study. Am J Gastroenterol. 2006;101(11):2511-9. doi: 10.1111/j.1572-0241.2006.00874.x. [PubMed: 17029607]. 16. Beppu K, Inokuchi K, Koyanagi N, Nakayama S, Sakata H, Kitano S, et al. Prediction of variceal hemorrhage by esophageal endoscopy. Gastrointest Endoscop. 1981;27(4):213-8. 17. Bureau C, Metivier S, Peron JM, Selves J, Robic MA, Gourraud PA, et al. Transient elastography accurately predicts presence of significant portal hypertension in patients with chronic liver disease. Aliment Pharmacol Ther. 2008;27(12):1261-8. doi: 10.1111/j.1365-2036.2008.03701.x. [PubMed: 18397389]. 18. Carrion JA, Navasa M, Bosch J, Bruguera M, Gilabert R, Forns X. Transient elastography for diagnosis of advanced fibrosis and portal hypertension in patients with hepatitis C recurrence after liver transplantation. Liver Transpl. 2006;12(12):1791-8. doi: 10.1002/lt.20857. [PubMed: 16823833]. 19. Lemoine M, Katsahian S, Ziol M, Nahon P, Ganne-Carrie N, Kazemi F, et al. Liver stiffness measurement as a predictive tool of clinically significant portal hypertension in patients with compensated hepatitis C virus or alcohol-related cirrhosis. Aliment Pharmacol Ther. 2008;28(9):1102-10. doi: 10.1111/j.1365-2036.2008.03825.x. [PubMed: 18691352]. 20. Vizzutti F, Arena U, Romanelli RG, Rega L, Foschi M, Colagrande S, et al. Liver stiffness measurement predicts severe portal hypertension in patients with HCV-related cirrhosis. Hepatology. 2007;45(5):1290-7. doi: 10.1002/hep.21665. [PubMed: 17464971]. 21. Kazemi F, Kettaneh A, N'Kontchou G, Pinto E, Ganne-Carrie N, Trinchet JC, et al. Liver stiffness measurement selects patients with cirrhosis at risk of bearing large oesophageal varices. J Hepatol. 2006;45(2):230-5. doi: 10.1016/j.jhep.2006.04.006. [PubMed: 16797100]. 22. Shi KQ, Fan YC, Pan ZZ, Lin XF, Liu WY, Chen YP, et al. Transient elastography: a meta-analysis of diagnostic accuracy in evaluation of portal hypertension in chronic liver disease. Liver Int. 2013;33(1):62-71. doi: 10.1111/liv.12003. [PubMed: 22973991]. 23. Reiberger T, Ferlitsch A, Payer BA, Pinter M, Homoncik M, Peck-Radosavljevic M, et al. Non-selective beta-blockers improve the correlation of liver stiffness and portal pressure in advanced cirrhosis. J Gastroenterol. 2012;47(5):561-8. doi: 10.1007/s00535-011-0517-4. [PubMed: 22170417]. 24. Sanyal AJ, Fontana RJ, Di Bisceglie AM, Everhart JE, Doherty MC, Everson GT, et al. The prevalence and risk factors associated with esophageal varices in subjects with hepatitis C and advanced fibrosis. Gastrointest Endosc. 2006;64(6):855-64. doi: 10.1016/j.gie.2006.03.007. [PubMed: 17140886]. 25. Thabut D, Trabut JB, Massard J, Rudler M, Muntenau M, Messous D, et al. Non-invasive diagnosis of large oesophageal varices with FibroTest in patients with cirrhosis: a preliminary retrospective study. Liver Int. 2006;26(3):271-8. doi: 10.1111/j.1478-3231.2005.01227.x. [PubMed: 16584387]. 26. Madhotra R, Mulcahy HE, Willner I, Reuben A. Prediction of esophageal varices in patients with cirrhosis. J Clin Gastroenterol. 2002;34(1):81-5. [PubMed: 11743252]. 27. Cottone M, D'Amico G, Maringhini A, Amuso M, Sciarrino E, Traina M, et al. Predictive value of ultrasonography in the screening of non-ascitic cirrhotic patients with large varices. J Ultrasound Med. 1986;5(4):189-92. [PubMed: 3514947]. 28. Pilette C, Oberti F, Aube C, Rousselet MC, Bedossa P, Gallois Y, et al. Non-invasive diagnosis of esophageal varices in chronic liver diseases. J Hepatol. 1999;31(5):867-73. 29. Schepis F, Camma C, Niceforo D, Magnano A, Pallio S, Cinquegrani M, et al. Which patients with cirrhosis should undergo endoscopic screening for esophageal varices detection?. Hepatology. 2001;33(2):333-8. doi: 10.1053/jhep.2001.21410. [PubMed: 11172334]. 30. Wang JH, Chuah SK, Lu SN, Hung CH, Chen CH, Kee KM, et al. 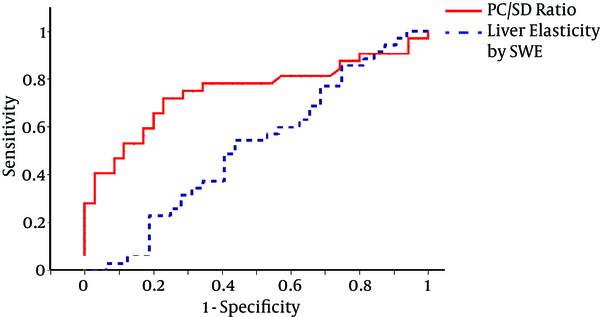 Transient elastography and simple blood markers in the diagnosis of esophageal varices for compensated patients with hepatitis B virus-related cirrhosis. J Gastroenterol Hepatol. 2012;27(7):1213-8. doi: 10.1111/j.1440-1746.2012.07132.x. [PubMed: 22432969]. 31. Witters P, Freson K, Verslype C, Peerlinck K, Hoylaerts M, Nevens F, et al. Review article: blood platelet number and function in chronic liver disease and cirrhosis. Aliment Pharmacol Ther. 2008;27(11):1017-29. doi: 10.1111/j.1365-2036.2008.03674.x. [PubMed: 18331464]. 32. Schwarzenberger E, Meyer T, Golla V, Sahdala NP, Min AD. Utilization of platelet count spleen diameter ratio in predicting the presence of esophageal varices in patients with cirrhosis. J Clin Gastroenterol. 2010;44(2):146-50. doi: 10.1097/MCG.0b013e3181a745ff. [PubMed: 19593164]. 33. Abu El Makarem MA, Shatat ME, Shaker Y, Abdel Aleem AA, El Sherif AM, Moaty MA, et al. Platelet count/bipolar spleen diameter ratio for the prediction of esophageal varices: The special Egyptian situation: Noninvasive prediction of esophageal varices. Hepat Mon. 2011;11(4):278-84. [PubMed: 22087154]. 34. Cherian JV, Deepak N, Ponnusamy RP, Somasundaram A, Jayanthi V. Non-invasive predictors of esophageal varices. Saudi J Gastroenterol. 2011;17(1):64-8. doi: 10.4103/1319-3767.74470. [PubMed: 21196656]. 35. Nashaat EH, Abd-Elaziz H, Sabry M, Ibrahim A. Non-endoscopic predictors of esophageal varices and portal hypertensive gastropathy. Nature Sci. 2010;8(6):43-50. 36. Kim BK, Han KH, Park JY, Ahn SH, Kim JK, Paik YH, et al. A liver stiffness measurement-based, noninvasive prediction model for high-risk esophageal varices in B-viral liver cirrhosis. Am J Gastroenterol. 2010;105(6):1382-90. doi: 10.1038/ajg.2009.750. [PubMed: 20087336]. 37. O'donohue J, Ng C, Catnach S, Farrant P, Williams R. Diagnostic value of Doppler assessment of the hepatic and portal vessels and ultrasound of the spleen in liver disease. European J Gastroenterol Hepatol. 2004;16(2):147-55. 38. Picardi M, Martinelli V, Ciancia R, Soscia E, Morante R, Sodano A, et al. Measurement of spleen volume by ultrasound scanning in patients with thrombocytosis: a prospective study. Blood. 2002;99(11):4228-30. [PubMed: 12010832]. 39. Kashani A, Salehi B, Anghesom D, Kawayeh AM, Rouse GA, Runyon BA. Spleen size in cirrhosis of different etiologies. J Ultrasound Med. 2015;34(2):233-8. doi: 10.7863/ultra.34.2.233. [PubMed: 25614396].